Not even a shoulder injury was going to stop Carlton Williams from breaking his own world record for push-ups in an hour. This past July, the man from the tiny town of Barry, Wales, entered a gym in his adopted home of Margaret River, Australia, and completed 2,220 push-ups in a single hour, easily surpassing the mark of 1,874, which he himself had set a year earlier. He’s not positive where he sustained the injury, but he guesses it resulted from a combination of the three months he spent training for the record and his job as a construction worker. At 50, Williams’ age might seem like a hindrance to setting any record that requires much physical strength and endurance, but he dismisses that too. “I reckon I’m pretty much the same now as I was at 25 or 30,” he says. “I’ve never been into drink or drugs. I don’t eat much. I’m a vegetarian. 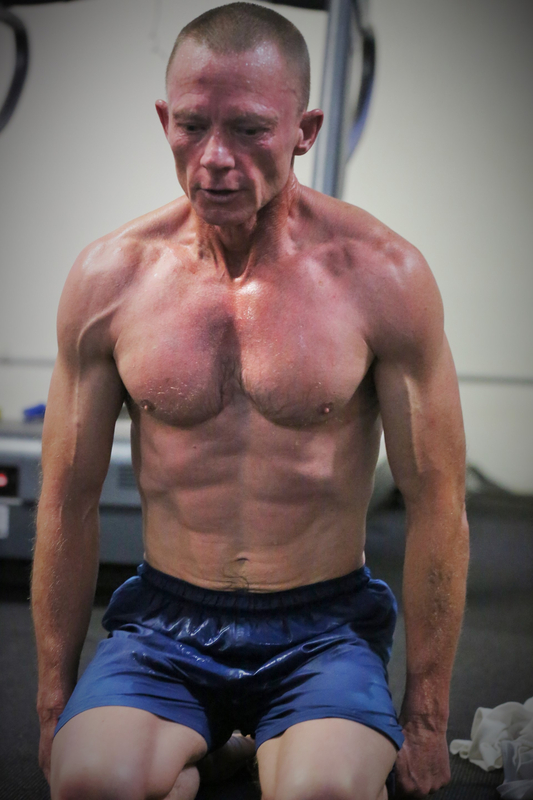 I don’t indulge.” Looking at the record-breaking video of the slight 5’ 5” and 126-pound man, it is hard to imagine a leaner, more sinewy body, no matter what age. Push-ups are regarded as one of the best exercises for arms, shoulders, chest and core, if done properly and fully, but what is a full push-up? According to Guinness Book of Worlds Records, it means lowering the body until a 90-degree angle is attained at the elbow. The body must remain straight throughout, no bending at the knees or waist; the body is raised until the arms are straight (although not locked at the elbow). Watching Williams do his 2,220 push-ups, it’s easy to overlook how deeply he goes in each one. What you can’t miss is the pace at which he does them. In the end, he averaged over 37 push-ups per minute. But his first set, 90 rapid-fire push-ups, accomplished in a mere 57 seconds, setting a clip of just over 1 ½ push-ups per second, is the most visually arresting. What follows for the next 59 minutes are relentlessly consistent sets of ten push-ups, each set interrupted by Williams sitting back on his heels for one or two deep breaths before bowing down to start another set of ten. The clock never stops running between sets. Williams is not quite done with push-ups. He plans to break his record again next July. To him, it’s just simple mathematics. He believes if he does 100 on his first set, and then follows it with sets of eleven instead of ten, he’ll make it up to over 2,300.